Branded as “Italy’s Favorite Coffee,” Lavazza is known for combining different types of coffee from all around the world. Lavazza has a special line of espresso brewers accompanied by Lavazza capsules such as Crema & Aroma and Espresso Blue. Lavazza incorporates more than 100 years of experience to bring you authentic flavors and quality in each and every espresso. Thanks to Lavazza capsules, you can enjoy premium espressos, cappuccinos, cafe lattes and other traditional Italian coffees. Luigi Lavazza founded Lavazza in 1895. Originally starting out in a small grocery store in Turin, Italy, Lavazza coffee products are now distributed internationally. Lavazza has been owned by the same family for four generations. US Coffee proudly offers two Lavazza brewers for office use; the Lavazza Blue LB 2312 and the Lavazza Espresso Point. Your employees can get professional-quality espresso during their work day with these commercial coffee machines. Decadent Lavazza coffee comes in whole bean coffee, ground coffee and capsule form. Lavazza coffee is the best mid-day pick-me-up for a perfectly brewed cup of espresso, brewed right in the comfort of your office’s breakroom. Your employees will love you for it! 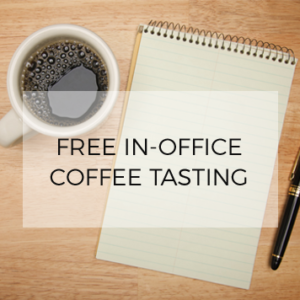 US Coffee understands how hard it is to choose the perfect office coffee service. That’s why we let you try one of our Lavazza brewing systems and provide a coffee tasting – for free. Sign up today!